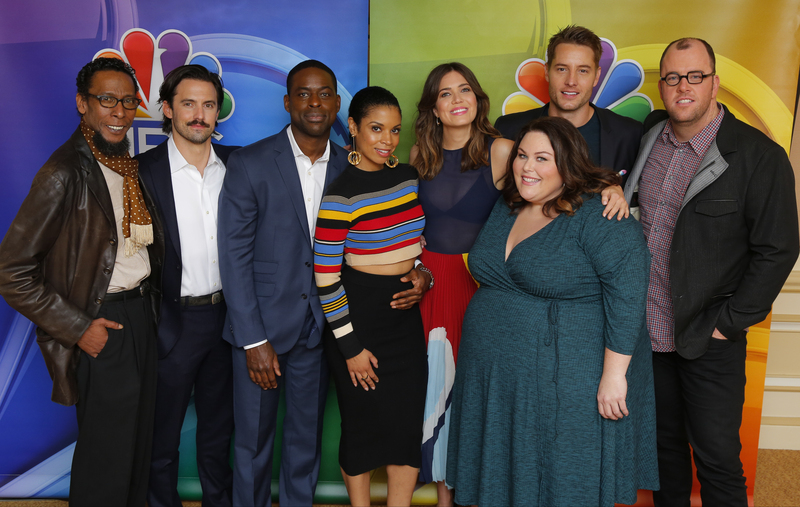 If you thought you went through a wave of emotions learning that This Is Us had been renewed for TWO seasons, just imagine what was running through the minds of the all-star cast. You actually don’t even have to imagine it. You can watch it, because series creator Dan Fogelman FILMED the cast’s reaction as soon as it was announced that they were going to be a family for 36 more episodes on the hit NBC show. The big news was dropped onstage at the Television Critics Association winter press tour, but the whole cast — Milo Ventimiglia, Mandy Moore, Sterling K. Brown, Chrissy Metz, Chris Sullivan, Justin Hartley, Susan Kelechi Watson, and Ron Cephas Jones — were told before they took to the stage. In a huddle with NBC Entertainment President Jennifer Salke, she breaks the news to them: They’re coming back, and coming back for so much MORE. In the most adorable fashion, leading-lady Mandy literally grabs her heart and gasps, while you can hear Chrissy yelling in the background, “Wait, WHAT DID YOU JUST SAY?” The two then literally jump and down while squealing, and it is the cutest mother-daughter moment. While all of this is very adorable, the real MVP of this epic This Is Us reveal is Sterling K. Brown. He gives the best “what” face in the entire world, and it’s hard not to imagine about what HE’S thinking about at this very moment (do you think he’s panicking because now he now has to call Ryan Murphy and tweak a shooting schedule for the next American Crime Story??). Whatever emotion is running through Sterling’s head (and don’t worry, he admits in the video he’s happy) we can’t wait to see what’s next for Randall, and the rest of the Pearson family. Here’s to SO MANY MORE happy-tears with this crew.